Ohio freshman Jerome Buckner (8) pulls away from Buffalo sophomore Tyrone Hill (33) on his way to the end zone, during the Bobcats’ 52-17 victory on Wednesday at Peden Stadium in Athens, Ohio. 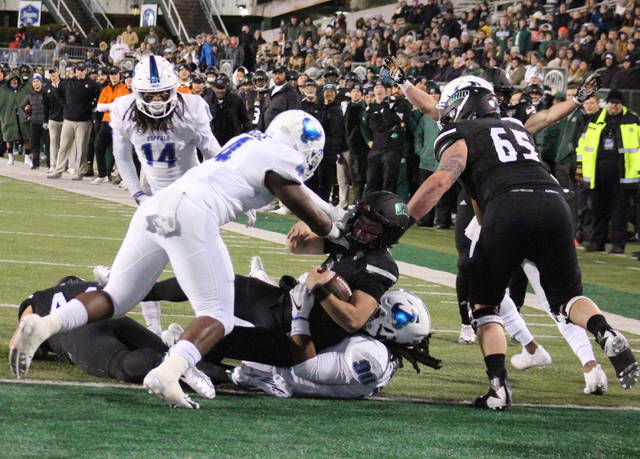 ATHENS, Ohio — After giving teams the horns all season, Buffalo planed on wrapping up the Mid-American Conference East Division title on Wednesday at Peden Stadium. The one thing the Bulls didn’t count on, you mess with the Bobcats, you get the claws. The Ohio football team forced five turnovers and rolled to a 52-17 victory over the division-leading Bulls, as Buffalo allowed a season-high 646 yards of total offense. UB (9-2, 6-1 MAC) went 75 yards in seven plays on the game’s opening drive, that featured Anthony Johnson hauling in a 48-yard pass from Tyree Jackson, who delivered the game’s first touchdown on a four-yard run with 2:18 into play. Adam Mitcheson made his first of two-point after kicks, giving Buffalo a 7-0 edge. Ohio (7-4, 5-2) countered on its first possession, going 75 yards in 12 plays, with senior Maleek Irons finding the end zone from two yards out. Louie Zervos made his first of seven extra points, tying the game at seven with 6:45 left in the first. On the third play of the ensuing UB drive, Kylan Nelson intercepted a pass, giving the Bobcats the ball at their own 34. Ohio immediately flipped ends of the field, as A.J. Ouellette broke a 31-yard run on the very next play. Six plays later, Ohio took a 14-7 lead with a two-yard Nathan Rourke touchdown run. Next, the Bobcat defense forced a three-and-out, and Ohio took over at its own 34. On the fourth play of the drive, facing a third-and-15, Rourke found true freshman Jerome Buckner for a 60-yard touchdown pass, stretching the OU lead to 21-7. On the third play of Buffalo’s next drive, Jarren Hampton intercepted a pass and brought it back to the UB 27. Five plays later, Ohio came up three yards short of a first down and five yards short of the end zone, and settled for a 22-yard Zervos field goal for a 24-7 lead. The next Bulls drive featured a pair of first downs with Jackson breaking a 55-yard run on the fifth play, but Nelson stripped the ball and Javon Hagan recovered for the hosts 96 yards from the end zone. 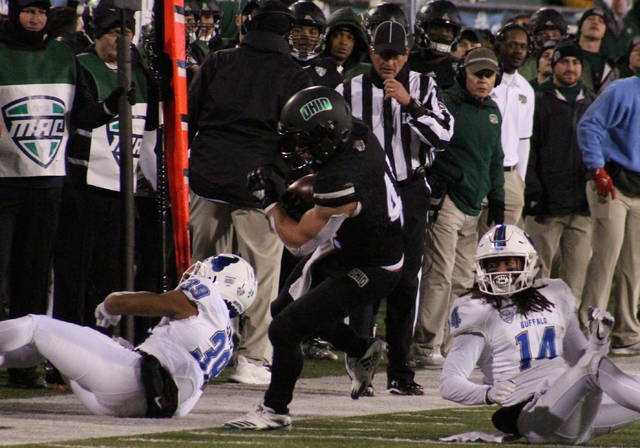 Ohio embarked on the long journey with four straight carries by Ouellette, and on the fifth play, Rourke kept the ball and rumbled 42 yards to the UB 43. Six plays later, Ouellette took his sixth carry of the drive eight yards for a touchdown, making Ohio’s lead 31-7 with 53 seconds left in the half. Buffalo was able to trim its deficit to 21 points on the final play of the half, as Mitcheson capped off a six-play, 46-yard drive with a 40-yard field goal. The Bobcats began the second half with a pair of first down passes, followed by six consecutive carries, five by Ouellette. Facing a third-and-six, Rourke found Ouellette for an eight-yard scoring grab, making the OU lead 38-10 with 9:44 to go in the quarter. Buffalo went three-and-out, and Ohio’s lead grew to 45-10 with 6:34 left in the third, as Rourke found Papi White for a 27-yard scoring pass. 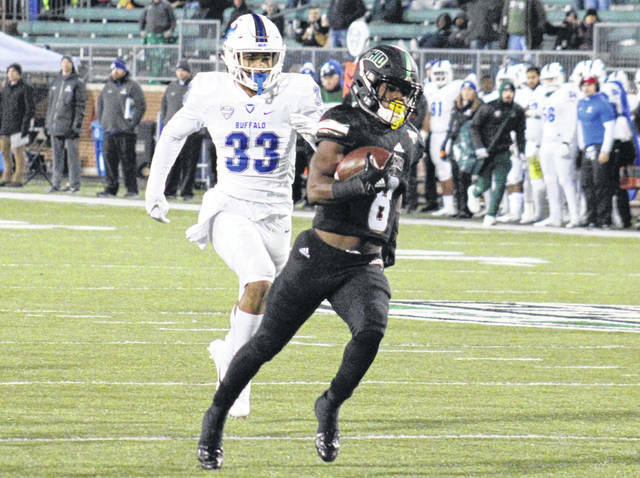 UB went three-and-out again, but the Bobcats committed their first turnover on the fifth play of their next drive, as Khalil Hodge intercepted a pass. During the return, Ohio’s Joe Lowery forced a fumble — the first of his career — and Rourke recovered for the hosts. OU failed to take advantage of the second chance and punted for the first and only time after just three plays. Buffalo put together a nine-play, 91-yard drive in just 2:25, with Kevin Marks scoring on a 13-yard run to cut Ohio’s lead to 45-17 with 13:14 left in regulation. The Bobcats scored the final points of the 52-17 victory on the ensuing drive, as Ouellette broke a 33-yard run with 8:36 to play. Following the triumph, 14th-year Ohio head coach Frank Solich was happy to see the culmination of all his team’s work. The Bobcats claimed a 32-to-13 edge in first downs, converting on 12-of-16 third downs and 1-of-1 fourth downs, while holding the Bulls to 3-of-9 on third down tries. 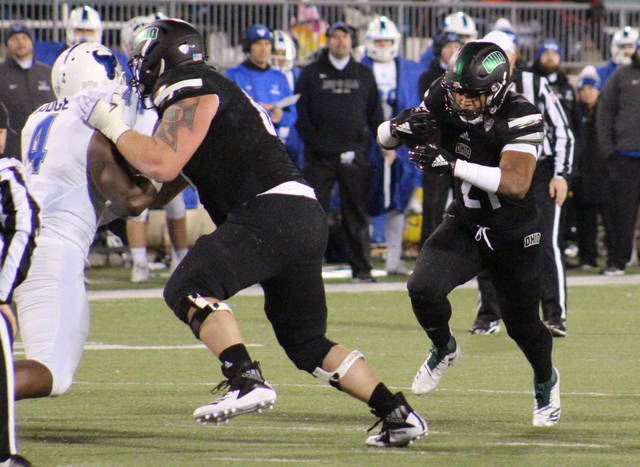 Ohio’s 646-to-277 advantage in total offense included a 437-to-157 edge on the ground. The 437 rushing yards mark both a season-high for the Bobcats, and the most the Bulls have allowed this fall. Ouellette finished with 212 total yards, combining 26 carries for 196 yards and two touchdowns with two receptions for 16 yards and another score. Following the game, the Ohio senior talked about his performance in a time of need for the Bobcats. Rourke — who carried the ball seven times for 82 yards and a score — completed 17-of-26 passes for 209 yards with three touchdowns and one interception. Irons carried the ball 12 times for 92 yards and a score, Quinton Maxwell added 45 yards on four carries, Jake Neatherton chipped in with 19 yards on five totes, and David Burroughs came up with eight yards on two tries. White led the Bobcat receiving unit with eight grabs for 84 yards and a touchdown. Andrew Meyer hauled in four passes for 41 yards, while Buckner, Connor Brown and Cameron Odom caught a pass apiece, earning 60, five and three yards respectively. Evan Croutch led the Ohio defense with five tackles, while Kent Berger had the team’s lone tackle for a loss. Nelson, Hampton and Tariq Drake each intercepted a pass, Nelson and Lowery both forced a fumble, while Hagan and Rourke both recovered a fumble. Zervos now has 154 extra point makes for his career, the most in program history. For Buffalo, Jackson was 9-of-21 passing for 116 yards, while leading the team with 70 yards and a touchdown on three carries. Johnson hauled in a team-best six passes for 95 yards, while Hodge had 11 tackles and a interception to lead the UB defense. Ohio improves to 15-10 in all-time meetings with the Bulls, including 8-6 in the Solich era. Ohio may have only delayed the Bulls MAC East championship, as Buffalo can clinch the trip to the MAC title game with a win at Bowling Green on Black Friday. The Green and White also wrap up their regular season at noon on Black Friday, as Ohio hosts Akron in a game nationally televised on CBS Sports Network.